Renovated in 1995 and expanded in 2010, Pastosa Ravioli of West Brighton carries wonderful food items for everyone! With a high Zagat Guide Review and many positive write-ups, Pastosa Ravioli of West Brighton is a specialty shop that shouldn’t be missed! Containing over 200 cheeses from around the world, a fresh fish department, a fresh meat department with an in-house butcher always on premise, aisles of organic fresh fruits and vegetables, and many specialty prepared foods cooked daily, you’ll certainly find something you’ll love. We also offer Full Catering Service, Gift Boxes for Shipping, Gift Baskets for Delivery or Pickup, and various Gift Cards. 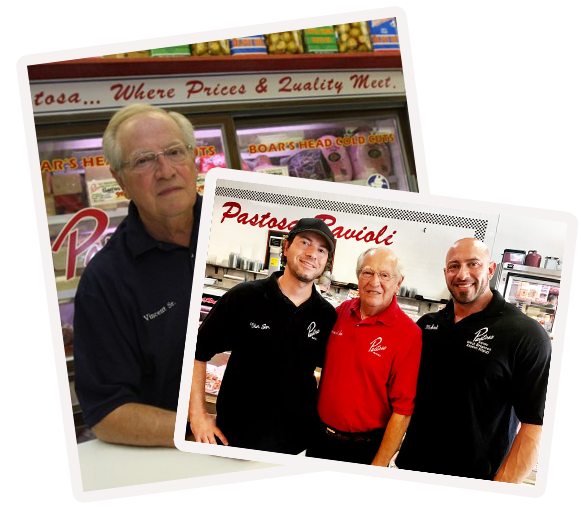 Owned by Vincent D’Antuono, Sr., an American Veteran and operated by his two sons, Vincent Jr. and Michael, Pastosa Ravioli of West Brighton is a strong presence on Staten Island and an experience that shouldn’t be missed! Copyright © 2018 Pastosa Ravioli, Macaroni & Noodle Corp. All Rights Reserved. Built With Volusion.